If I could predict the future, I would be a very rich man. However, I am not a very rich man. That does not mean it is impossible to pick an outrageous upset in August. It is just unlikely. Hey, this whole article is about underdogs. I am going to shock the world and do the impossible, I mean unlikely. One thing every college football fan knows is ranked teams lose to unranked non-conference opponents every year. 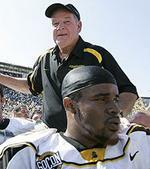 For example, Michigan lost to Appalachian State last year in week one in 2007. I am not going to predict a FCS team to beat an FBS team, although Appalachian State travels to Louisiana State this year (I am just saying Tiger fans! ), but I am going to make note of a few games that are worth keeping an eye on early in the 2008 season. Some of the games on here may not influence who makes a January 1st bowl, but you would be lying if you told me that Middle Tennessee State beating Maryland is not a possible upset worth noting. Discuss this article, the complete SCS.com College Football Preview, and more on the brand new SCS.com Message Board! Southern California @ Virginia - If Mark Sanchez is not healthy, the quarterback duties will be handed to Arkansas transfer Mitch Mustain. USC better not overlook Virginia before their game with Ohio State in week three. East Carolina @ Virginia Tech - Skip Holtz, one of the best coaches in college football, always gets ECU to compete with the big boys. Hawaii @ Florida - Hawaii may not be as good as they were in 2007, but that does not mean that they will be lousy. Their defense is the key. If they can slow down Tebow and Company (an extremely hard task), they have a chance. Mississippi State @ Louisiana Tech - This is the year Mississippi State makes the jump from bottom dweller to competitive. Louisiana Tech is a program that will be a contender in the WAC for the next several years. Is Mississippi State going to be able to deal with the expectations. Utah @ Michigan - Michigan is going to have to fight off several upset bids early in the season. Rich Rodriguez’s offense is not going to run smoothly in the season opener. A hiccup is nearly unavoidable. Florida Atlantic @ Texas - The best team you have never heard of, the Owls are primed for another big year. They return 21 starters to a team that beat Minnesota last season. Rusty Smith leads a dynamic passing attack that might give the Longhorns fits. Oregon State @ Penn State - Beating Penn State in Happy Valley is no easy task. However, Oregon State is a deep team that might be able to beat a Penn State team that will have a new QB in 2008 (A QB that has yet to be named). Cincinnati @ Oklahoma - Cincinnati is going to be a great team this season. However, they lost their star quarterback Ben Mauk. Nevertheless, they return a great set of receivers that will make an average quarterback look like a star. Maryland @ Middle Tennessee - Is Middle Tennessee going to be a Sun Belt contender? Probably not. However, they put 42 points up on Louisville last season. Maryland , who has been hovering around mediocrity for the past few years, might find themselves struggling on the road against the Blue Raiders. Southern Miss @ Auburn -Southern Miss has quietly made 10 bowl trips in the past 11 seasons. Auburn needs to avoid looking ahead to SEC play and focus of Southern Miss. BYU @ UCLA - Will it be an upset if BYU beats UCLA? Probably not. However, it will put BYU in a great position to go 12-0. Also, any time a good mid-major beats a solid BCS conference team, it is an upset in my book. Oklahoma @ Washington - Do I feel bad for putting Oklahoma on here three times? Yes, but they have a tough out of conference schedule and it is worth noting. At Washington is never an easy game, especially now that Jake Locker has a season under his belt. Arkansas @ Texas - Bobby Petrino is going to struggle in his first saeason at Arkansas. However, that does not mean that they will not give Texas a tough game. It will take a miracle to for the Hogs to beat Texas, but I have seen crazier things happen. UAB @ Tennessee - Tennessee loves to schedule UAB. Last time they did, in 2005, UAB kept it close, losing 17-10. This prediction is based purely off history, and the fact that Jonathan Crompton has been throwing to many interceptions in Spring ball. SMU @ Texas Tech - June Jones is at SMU, and it is only a matter of time until he turns them into a BCS contender. He will have the troops ready against Graham Harrell’s Red Raiders. Nevada @ Missouri - Nevada, arguably, has the best quarterback and running back in the WAC. In addition, Chris Ault is one of the college football’s best coaches. Missouri better be ready for a battle. UCF @ Boston College - Boston College begins life without star quarterback Matt Ryan. UCF begins life without Kevin Smith. Who will have adapted by week 4? West Virginia @ Colorado - West Virginia is a likely national title contender, but they have a few question marks surrounding their team. Most notably, is Bill Stewart going to be as successful as Rich Rodriguez? Colorado, on the other hand, is a young team might be ready to blossom into a Big 12 contender in 2008. Darrell Scott and Cody Hawkins lead a dynamic Colorado offense that might get WVU trouble. Georgia @ Arizona State - One of the most intriguing out of conference games in 2008, Georgia ventures out of the South to play a very talented Arizona State team. Dennis Erickson is a great coach, but his team is going to have to play a perfect game at home to beat the country’s best team. Central Michigan @ Purdue - These teams know each other fairly well, since they played two times last season (Purdue blowing CMU out in game one, and sneaking out a win in game two.) CMU quarterback Dan LeFevour can keep any game close. TCU @ Oklahoma - Sorry Oklahoma fans, your team is here again. If you ask me, I expect OU to go 4-0 in out of conference play. However, TCU beat them in 2005, and they return a solid team. Virginia Tech @ Nebraska - Virginia Tech will likely be ranked in the top 10 going into week five. Nebraska will be lucky to break the top 25. However, I think Nebraska is going to have a great season and Virginia Tech is going to have a tough time beating the Cornhuskers in Lincoln, Nebraska. Check out the brand new SCS.com Message Board! Copyright © 2004-2009 SouthernCollegeSports.com. All rights reserved. This website is an unofficial and independently operated source of news and information not affiliated with any school, team, or league.